Century 21: Biblical Unity or Papal Conformity? On Sunday, March 12, the first Sunday of Lent, the Pope presided over a solemn ceremony called "The Day of Pardon" in St. Peter’s Basilica, Rome, in which he asked God for forgiveness for the historical wrongs of the Roman Catholic Church (RCC). The ceremony was presented as another profoundly significant event in the RC Church’s "Millennium Jubilee Holy Year" and a further step, unprecedented but necessary, in the process of unity. It was a modern media event staged for maximum impact to encourage "unity". The impression given is that it is a genuine attempt to wipe the slate clean and to apologize for the past wrongs of the Church. "Merciful Father, on the night before his Passion your Son prayed for the unity of those who believe in him: in disobedience to his will, however, believers have opposed one another, becoming divided, and have mutually condemned one another and fought against one another. We urgently implore your forgiveness and we beseech the gift of a repentant heart, so that all Christians, reconciled with you and with one another will be able, in one body and in one spirit, to experience anew the joy of full communion. We ask this through Christ our Lord." If the Pope and the Roman Curia were really serious about their prayer offered to Holy God, they must face the fact that condemning curses of their Council of Trent were not mentioned nor repented of, including the condemnation of the Biblical Gospel and historical biblical Christianity, which led to the wholesale slaughter of millions of Christians during the 667 years of the Inquisition, and which have never been revoked, Vatican Council II notwithstanding. If this prayer were answered, it would be necessary to dismantle the RCC with its false gospel, papal infallibility, and "irreformable"2 ways, which clearly the Pope and his Curia have no intention of doing. "The Week of Christian Unity"
The gathering of mainstream churches at St. Paul’s Basilica in Rome earlier this year is thought to have been the largest assembly of Christian leaders with a Pope since the Vatican Council II in the early 1960s. On January 18th, the Tuesday of the week which had been designated ‘The Week of Christian Unity’ in the ‘Holy Year, 2000’, leaders representing four fifths of Eastern Orthodoxy gathered alongside Anglicans, Lutherans, Methodists and Pentecostals. They were participating in celebration of the opening of the ‘Holy Door at St. Paul Outside the Walls’. Archbishop George Carey, Primate of the Church of England, and Metropolitan Athanasius, representing Bartholomew, Patriarch of Constantinople and head of the Orthodox Church, knelt on either side of Pope John Paul II before the newly opened door. Only one cushion had been provided as it was thought that only the Pope would kneel, but when they both fell to their knees, too, the Pope called out, "Unity! Thank you!" It was a highly symbolic moment. 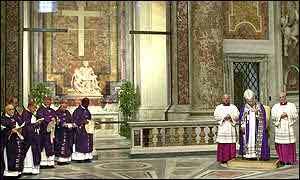 The Pontiff had every reason to express his gratitude to the Churches represented and the two men flanking him. After all, in May 1999, the joint Anglican Roman Catholic International Commission (ARCIC) had issued a statement "recognizing the Pope as the overall authority in the Christian World" and describing him as "a gift to be received by all Churches", (a gift yet to be accepted by the Synod of the Church of England and the wider Anglican Communion, however). Five months later in October, 1999, on Reformation Day, the Roman Catholic and Lutheran Churches had signed a joint declaration announcing that their opposing views on justification have been reconciled.3 With this declaration of reconciliation and unity, the way seems clear for the Lutherans to join the Anglicans in accepting Papal primacy. The frosty relationship of earlier years with the Russian Orthodox Church has warmed up and a Papal visit to Moscow and a meeting with Patriarch Alexy II is being discussed. Pentecostals and Charismatics have accelerated their Romeward journey and Evangelical leaders who have signed ECT ("Evangelicals and Catholics Together") have led very large numbers of Evangelicals to kneel before the open "holy" door that the Roman Catholic Church offers them. The "little by little" approach of the Vatican II document are now giant steps. How many present at the January 18th gathering understand what is really happening? The Pope’s official position is that "ecumenical encounter is not merely an individual work, but also a task of the [RC] Church, which takes precedence over all individual opinions. "7 Thus the opinions of others present on January 18th are "individual opinions" and worthless. The final goal of any dialogue with the RCC is, first and foremost, "unity" in a visible and specific ritual under the authority of the Roman Catholic Church, "all Christians will be gathered, in a common celebration of the Eucharist into that unity of the one and only Church….unity we believe dwells in the Catholic Church as something she can never lose." She could hardly state it more clearly. The same Apostle shows clearly the ground of true unity: "There is one body, and one Spirit, even as ye are called in one hope of your calling; One Lord, one faith, one baptism, One God and Father of all, who is above all, and through all, and in you all. "10 Believers, therefore, who adhere to God only and His Written Word, as did the Lord and the Apostles after Him (‘Sola Scriptura’) are one in body, in Spirit, and in truth. They are saved before the all-Holy God by grace alone (‘Sola Gratia’), through faith alone (‘Sola Fide’), and in Christ alone (‘Solo Christo’) and all glory and praise is to God alone (‘Soli Deo Gloria’). These five biblical principles together show the foundation of true unity in the Lord. They have helped the persecuted church through the centuries to hold fast to the simplicity of the Gospel. True ecumenism is fellowship or working together in adherence to the five basic biblical principles that maintain the foundation of true unity in the Lord. To the degree to which these key basic biblical standards are embraced, true unity will be evident. On the other hand, false ecumenism, typically institutionalized, is the joining together for common causes of professing Christian groups, when in fact one or more of the parties involved are unconverted. While purporting to confess the Lord Jesus Christ according to the Scriptures, for the most part the five biblical principles that display the basis of true unity in the Lord are compromised. The extent to which these principles are not upheld usually shows the inclination of the church or group to submit to Rome. The World Council of Churches is such an institution. Within it, there is no agreement on any of the five principles that demonstrate the fact that the foundation of true unity is in the Lord Jesus Christ alone. The Pope and his Church, likewise in apostasy from the true Gospel, are also without any of the five biblical standards. 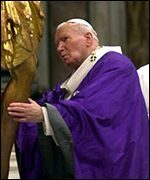 Counterfeiting the body of the Lord Jesus Christ, they are intent on finding successful ways to bind all to the very visible, active and attractive pontifical throne. The RCC is attempting to forge a man-made unity, visible by means of an institution to which all must conform. Such a conception stands in direct contradiction to the reality of believers who, having been placed invisibly in Christ by God, are to maintain the bond of unity given them by the Holy Spirit. Canon 752 "A religious respect of intellect and will, even if not the assent of faith, is to be paid to the teaching which the Supreme Pontiff or the college of bishops enunciate on faith or morals when they exercise the authentic magisterium even if they do not intend to proclaim it with a definitive act..."
A brief acquaintance with history readily reveals that coercion is a term that the Roman Church understands very well. Naturally, when ushering all comers into her big tent, she makes light of its implications; but when once again in direct control of the levers of political power (which may well be provided by the fast advancing European superstate), Canon 1311 could acquire that same notoriety as those which have so darkened the pages of history. It is important to remember always that the Roman Papacy is an absolute monarchy and also a secular government. Enormously wealthy, it has territorial sovereignty, its court, nobles, and diplomatic corps; its detective force and secret service; its laws, advocates, and system of jurisprudence as well as prison; taxes, bank, foreign treaties and concordats, enormous political influence, ambitious plans and policies, all as much as any secular kingdom. And it still has the Inquisition, now styled the Office of the Doctrine of the Faith, headed by Joseph Cardinal Ratzinger. Believers of old were clear to call the Roman Catholic Church’s imposed conformity "Satan's seat" or the Antichrist. This was known and spoken of even through the Middle Ages by Dante Alghieri (d. 1321), John Wycliff (d. 1384), John Huss (d. 1415), Savonarola (d. 1498), and William Tyndale (c. l536). So Rome’s conformity was described as Antichrist from the time of Reformation by Martin Luther (d. 1546), Nicholas Ridley (d. 1554), John Bradford (d. 1555), and John Foxe (d. 1587), and in more recent times by Isaac Newton (d. 1727) and Jonathan Edwards (d. 1758). Now as the "Holy" Roman Empire revives in the European Superstate, can believers afford to remain ignorant of both history and Biblical prophecy as understood throughout the centuries? Confident believers of old saw that unity is in Christ and, consequently, warned of the conformity with Rome. They both knew the true church in Christ, and recognized the apostate Church in Rome. Understanding that unity with the Roman Catholic Church always meant submission to her traditions and finally obedience to her Pope, they rejoiced that their unity was in the Beloved, rather than dallying with sin. Extravagantly, apparently without trembling, the Pope has again fulfilled the Lord’s prophetic Word (II Thessalonians 2:3-12) depicting the Man of Sin and Son of Perdition. The sitting Pope purports to take for himself a Divine position. Thus in Section III of the prepared program for the "Day of Pardon", "The Holy Father" is mentioned eight times. Nonetheless in the RCC, this title does not denote the All Holy One in heaven, but rather the sitting Pope. Seen in the light of Scripture, the RCC Pope who claims to be Christian, clearly is one "Who opposeth and exalteth himself above all that is called God, or that is worshipped; so that he as God sitteth in the temple of God, showing himself that he is God" (v. 4) The Pope of the RCC goes further when by taking to himself the title of "The Vicar of Christ", he presumes to take the place of Christ Himself, teacher, shepherd, and priest. This also is clearly tantamount to "as God sit[ting] in the temple of God, showing himself that he is God." The assertion is not simply made, for the Pope's law gives it teeth in exacting submission of mind and will and promising punitive action against those who fail to obey, as Canon 752 and 1311 document. He is the worst and greatest enemy of Christ who under the pretence of service to Christ, presumes to undermine His unique offices by covertly usurping His position and power. Permission is given by the authors to print and copy this article if it is done in its entirety without any changes. Permission is also given to place it on WebPages in its entirety without any changes. "This infallibility, however, with which the divine redeemer wished to endow his Church in defining doctrine pertaining to faith and morals...the Roman Pontiff...enjoys...when...he proclaims in an absolute decision...For this reason his definitions are rightly said to be irreformable by their very nature..." No. 28, Lumen Gentium, in Vatican Council II The Conciliar and Post Conciliar Documents, Austin Flannery, Ed., 1981 ed. (Northport, NY: Costello Publ. Co., 1975) p. 380. See Richard Bennett’s analysis, "The Roman Catholic-Lutheran ‘Joint Declaration on the Doctrine of Justification’: A Denial of the Gospel and the Righteousness of Christ". Flannery, No. 42, "Reflections and Suggestions Concerning Ecumenical Dialogue", S.P.U.C., 15 August 1975, p.549. Ibid., pp. 540-1. Bolding in any quotation indicates emphasis added in this paper. Ut Unum Sint, "That They May Be One: On Commitment to Ecumenism", John Paul II (Washington, DC: United States Catholic Conference) Publ. No. 5-050, Para. 97. Code of Canon Law, Latin-English Edition (Washington, DC: Canon Law Society of America, 1983).